Britain's Prince Harry and Meghan, Duchess of Sussex meet the cast after a gala performance of the musical Hamilton, in support of the charity Sentebale, at the Victoria Palace Theatre in London, Aug. 29 2018. 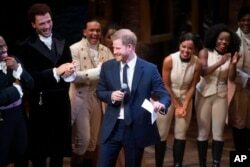 Prince Harry and his wife Meghan attended a performance of the hit musical Hamilton on Wednesday to raise money for a charity which works with children affected by HIV in southern Africa. At the end of the show, Harry and the musical's creator Lin-Manuel Miranda addressed the audience, said a statement from Harry's Kensington Palace residence. The London production, housed in the refurbished Victoria Palace Theatre, is the show's first foray outside of the United States after successful runs in Chicago, San Francisco and Los Angeles as well as Broadway in New York.